ChromeStart.info – How to remove? 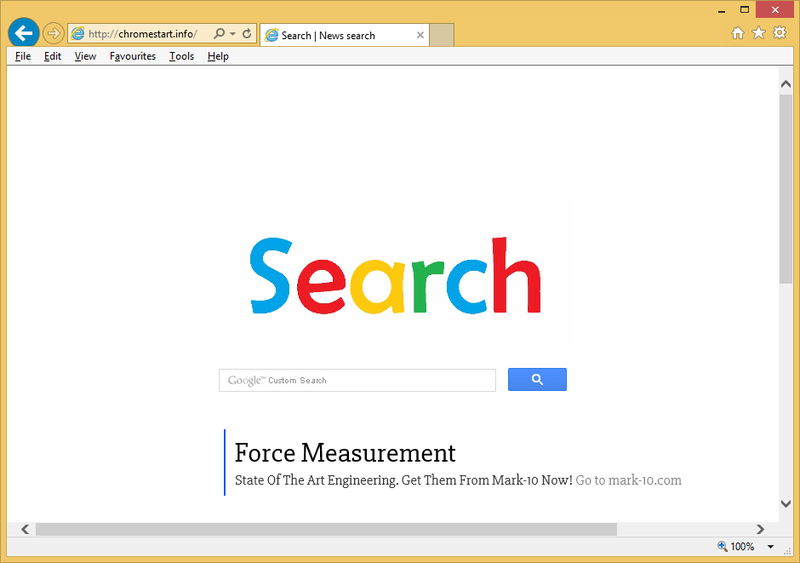 ChromeStart.info is a yet another browser hijacker that pretends to be related to Google Search. Please keep in mind that it has nothing to do with the legitimate engine, even if it looks similar to it. The visual resemblance is used to confuse computer users into thinking that ChromeStart.info is trustworthy, when that is simply not the case. The hijacker aims at generating web traffic and thus earning revenue for its creators. It does so by exposing you to advertising data. As the hijacker affects all well-known browsers, you will not achieve anything by switching to a different one. In order to get rid of the unwanted adverts and go back to your usual settings, you will have to terminate ChromeStart.info. You may be wondering how the hijacker ended up in your browsers. The answer to that question is simple: you acquired it through a free software bundle. When you install freeware or shareware, you get offers of additional programs that are presented to you in the wizard. Unless you specifically decline these offers, you agree to installing the unwanted apps without even realizing it. Make sure that never happens again. The most obvious change that you will notice after the hijacker takes over your browsers is that your home page and default search engine get switched to ChromeStart.info. This website uses a format similar to Google’s, however, it is clear that the domain cannot be trusted as it contains a fake ad. The search box that appears on the site will present you with unreliable sponsored content as well. Needless to say, the advertisements will not stop there. You will not be able to surf the Web without dealing with pop-ups, banners, in-text links, coupons, video ads, and so on. These ads will not only cause unnecessary disruptions, but they will also lower your online safety level. That is why we recommend that you get rid of ChromeStart.info as soon as you can. Two ways to eliminate ChromeStart.info from your browsers include manual and automatic removal. If you want to erase ChromeStart.info manually, you will have to uninstall its related application from your computer first. Once you do that, you can move on to fixing your browser settings. Instructions on how to complete these steps are provided in the manual ChromeStart.info removal guide below the article. The alternative solution is to implement an anti-malware utility. The malware prevention and removal tool from our site can help you delete ChromeStart.info and other potential threats from your PC. In addition to that, the security software can provide you with online protection in real time, so that you do not have to worry about infecting your system with similar or more dangerous parasites in the future.